The Chakras are the spinning wheels of energy that lie in the pranic energy body. Using crystals and stones for Chakra healing maintains the natural balance of the body and the flow of energy. For simple chakra balancing, place one stone of the appropriate type on each chakra area for a few minutes. Root Chakra (1st): Agate, Apache Tears, Aragonite, Black Tourmaline, Calcite, Black Star Diopside, Epidote, Garnet, Hematite, Herkimer Diamond, Jet, Labradorite, Lodestone, Obsidian, Onyx, Petrified Wood, Pyrite, Quartz Crystal, Red Jasper, Rhodocrosite, Ruby, Rutilated Quartz, Sapphire, Smokey Quartz, Stibnite, Sugilite, Tektite, Tiger Iron. Sacral (2nd): Agate, Amber, Aragonite, Calcite, Carnelian, Chalcedony, Chiastolite, Citrine, Herkimer Diamond, Labradorite, Moonstone, Pyrite, Quartz Crystal, Rhodocrosite, Rutilated Quartz, Stibnite, Sugilite, Sunstone, Tiger Iron. Solar Plexus (3rd): Amber, Ametrine, Calcite, Carnelian, Chalcedony, Citrine, Emerald, Herkimer Diamond, Jade, Labradorite, Mahogany Obsidian, Malachite, Moonstone, Picture Jasper, Orange Aventurine, Peridot, Prehnite, Pyrite, Quartz Crystal, Rhodocrosite, Rutilated Quartz, Stibnite, Sugilite, Sulphur, Sunstone, Tiger Eye, Tiger Iron, Topaz, Unikite, Yellow Fluorite, Yellow Jasper. Heart (4th): Amazonite, Angelite, Apatite, Aquamarine, Aragonite, Aventurine, Bloodstone, Blue Moonstone, Botswana Agate, Calcite, Charoite, Chrysocolla, Chrysoprase, Emerald, Epidote, Fluorite, Garnet, Green Tourmaline, Herkimer Diamond, Hiddenite, Jade, Kunzite, Labradorite, Lepidolite, Malachite, Moldavite, Morganite, Moss Agate, Ocean Jasper, Peridot, Pink Tourmaline (Rubellite), Prehnite, Pyrite, Quartz Crystal, Rhodocrosite, Rhodonite, Rose Quartz, Ruby, Rutilated Quartz, Strawberry Quartz, Stibnite, Sugilite, Unikite, Watermelon Tourmaline, Turquoise. 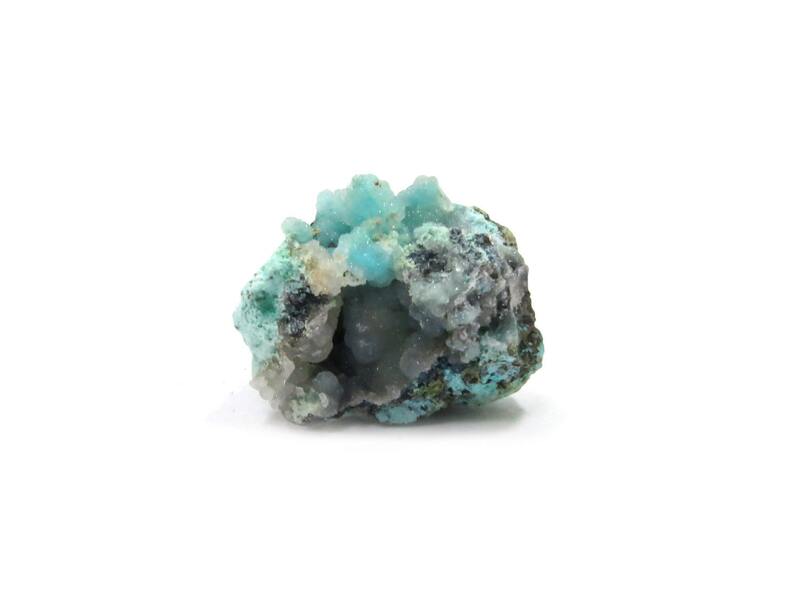 Throat (5th): Amazonite, Angelite, Apatite, Aquamarine, Azurite, Blue Lace Agate, Blue Topaz, Blue Tourmaline, Blue Calcite, Celestite, Chrysocolla, Herkimer Diamond, Kyanite, Labradorite, Lapis Lazuli, Larimar, Peacock Ore, Pyrite, Quartz Crystal, Rutilated Quartz, Sapphire, Sodalite, Stibnite, Sugilite, Turquoise. Third Eye or Brow Chakra (6th): Amethyst, Ametrine, Apophylite, Aragonite – purplish colors, Azurite, Azurite/Malachite, Celestite, Blue Kyanite, Charoite, Chrysocolla, Diamond, Emerald, Fluorite, Herkimer Diamond, Howlite, Iolite, Labradorite, Lapis Lazuli, Lepidolite, Moldavite, Moonstone, Opal, Peacock Ore, Pyrite, Quartz Crystal, Rutilated Quartz, Sapphire, Sodalite, Stibnite, Sugilite. Crown Chakra (7th): Amethyst, Ametrine, Apatite, Apophylite,, Calcite, Charoite, Clear Topaz, Clear Fluorite, Diamond, Herkimer Diamond, Howlite, Iolite, Kyanite, Labradorite, Lepidolite, Moonstone, Opal, Pyrite, Quartz Crystal, Rutilated Quartz, Selenite, Sugilite, Stibnite, Tanzanite, Tree Agate. Photos and content © 2007-2017 Instant Karma www.instantkarmastore.com, instantkarmashop.etsy.com, instantkarmastore@gmail.com. Please do not reproduce content or photos without our written consent. *The information on this website is provided for informational purposes only and is not intended to diagnose, prescribe, or treat any illness, or injury. "The Always Evolving", "Instant Karma", "Sacred and Meaningful Gifts" and Angel Logo are Registered NY State Service Marks.